There are two paintings by Wendy Pasmore in public collections in the UK, one with the Tate and the other the Arts Council. In contrast, Victor, her husband, is widely known and well represented in the same collections, an imbalance that in part reflects the difficulties faced by many woman artists in post-war Britain. With this retrospective exhibition of works from the Wendy Pasmore Estate, Jenna Burlingham Fine Art hopes, in some way, to redress this. Born in Dublin, Wendy (née Blood) and her family moved to England while she was still a child. In 1933, aged eighteen, Wendy convinced her father, an Army officer, to allow her to attend art school at Chelmsford, before moving to London in pursuit of her artistic career. It was there that she met, and modelled for, a fellow artist, Victor Pasmore (1908-1998). The two were married in 1940 as Victor’s career was beginning to flourish; he had been elected to the London Artist’s Association and the London Group in the early ‘30s, had founded the Euston Road School in 1938, and would go on to become a key figure of the European art world in the mid-century. Wendy and Victor were at the heart of London’s art scene. Their first home together was on Chiswick Mall, though they are most associated with an imposing house in Blackheath where they settled in 1948, a property still in the family today. Throughout the 1940s and early ‘50s Wendy continued to paint, but with Victor’s prospering career and two young children to care for, as well as her teaching roles, her own painting had become increasingly intermittent. In 1955, there was a shift in her career and Wendy was elected a Member of the Women’s International Art Club, a society that aimed to help women artists by arranging dedicated exhibitions of their work in prominent galleries, Sonia Delaunay, Elisabeth Frink, Gwen John and Lee Krasner among its members. Wendy first exhibited with the London Group the following year and became a Member in 1958. Having held teaching posts at a number of art colleges, including Sunderland and Scarborough, Wendy settled at Leeds, where she worked with Terry Frost and others to establish the foundation course that later grew into the Leeds College of Art. With interest in her work growing, in 1963, a retrospective was held for Wendy at the London galleries of Molton and Lords and she was thereafter regularly included in Summer Exhibitions at the Royal Academy. Aside from London, the Pasmores had a strong connection with Malta, falling for the country after a visit following the 1965 Venice Biennale. The two had acquired a 17th-century farmhouse near Gudja, named Dar Gamri, and settled in to island life with a house full of animals. In 2014, the capital city, Valletta, became home to the Victor Pasmore Gallery, a project that had long been pursued by Wendy and the Pasmore Foundation. Included in this exhibition are twenty paintings and collages from across Wendy’s career. 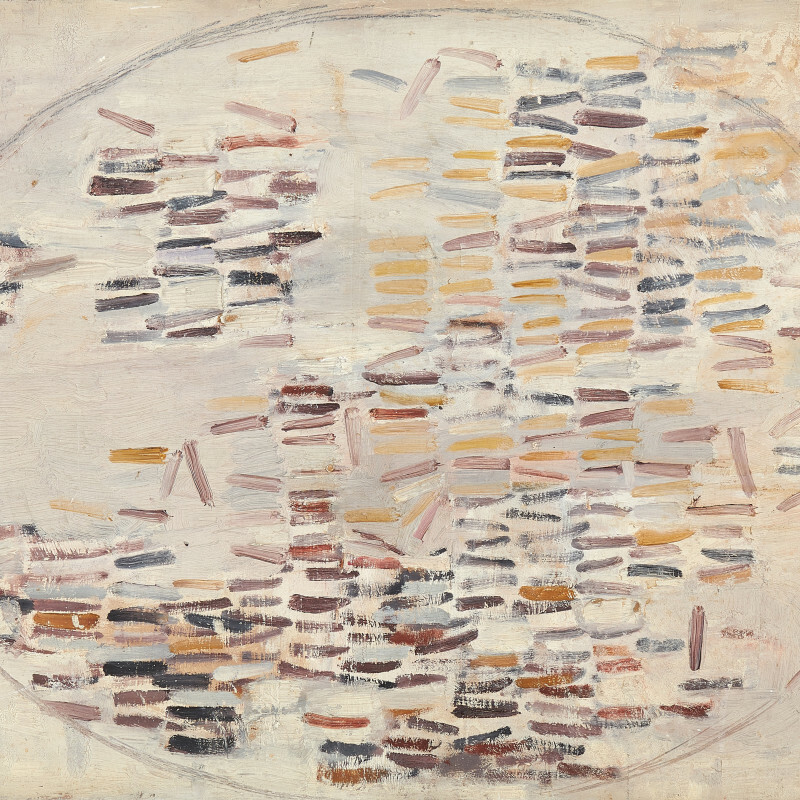 The earliest work is a still life from 1953, a period when she could produce little, though the majority are from the late ‘50s and early 1960s, after her move to abstraction; these are rhythmic arrangements of organic forms enclosed by ellipses that are painted using a restricted palette of muted tones. Wendy’s later works have a more graphic feeling, with looser, calligraphic mark- marking being worked over paper collage. We hope that this exhibition will go some way towards providing a voice for a quiet, but important, woman artist.